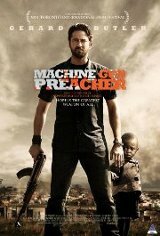 An ex-biker-gang member finds religion and makes the life-changing decision to go to East Africa to help repair homes destroyed by civil war. He is outraged by the unspeakable horrors faced by the region's vulnerable populace, especially the children. Ignoring the warnings of more experienced aide workers, he breaks ground for an orphanage where it's most needed: in the middle of territory controlled by the brutal Lord's Resistance Army (LRA), a renegade militia that forces youngsters to become soldiers before they even reach their teens. He finds himself having to balance preaching with using fighting skills from his biker days.